In my previous article, we introduce ourselves to some Pytorch methods. This article, we are going use Pytorch that we have learn to recognize digit number in MNIST dataset. What is MNIST? MNIST ("Modified National Institute of Standards and Technology") is the de facto “hello world” dataset of computer vision. Since its release in 1999, this classic dataset of handwritten images has served as the basis for benchmarking classification algorithms. Our goal is to write our own model and train it. Then we will our trained model to identify digits from a dataset of tens of thousands of handwritten images. 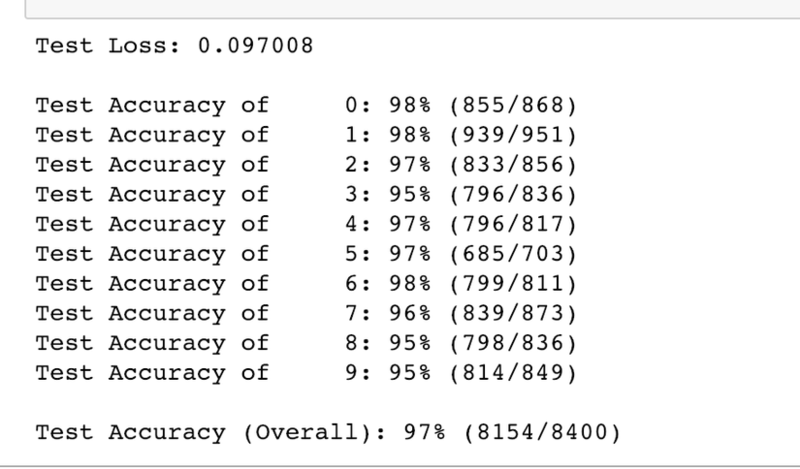 Finaly, we can benchmark our model by submitting its predicted result in Kaggle's digit recognizer competition. Now, let's get started. First we need to load needed libraries for this task. We assume that we already download train.csv, test.csv from Kaggle's digit recognizer and put it in folder input/. Next, we can load the data and analize it. As you can see in pic above we have 42000 rows and 785 columns where first column is label since it is a training dataset. So we have 784 or (28 * 28) input features to train on our model. Then we can exract and clear the train data for our model. # train test split. Size of train data is 80% and size of test data is 20%. Now we get all the data we need to train and test our model. However, we build the model using Pytorch where it can work on its tensor type only. Therefore, we need to transform our numpy array Pytorch tensor, luckily Pytorch has a function to do just this job. With Pytorch's TensorDataset, DataLoader, we can wrapping features and its labels so we can easily loop to get the train data and its label during training. # Data loader. Combines a dataset and a sampler, and provides single- or multi-process iterators over the dataset. Let's get data in a iteration. # convert tensor to numpy array so we can plot it. As we can see our images is a flatted 1d array, we need to reshape it into (28 * 28) so that we can plot into our graph. To build our own pytorch model, we can create a class and inherit from pytorch nn.Module. Then we can override two functions __init__, forward where we can define our own definetion. an input layer: it will take 784(28*28) input values and output 512. Now our model is build. Let choose loss and optimization functions for our model. There are many loss(L1Loss, MSELoss, CrossEntropyLoss, ...) and optimizer (Adam, SGD, ...) functions. However, we choose CrossEntropyLoss as our loss funcation since it's categorical clasification task and we use SGD (stochastic gradient descent) as our optimizer. But you can choose other function and optimizer. It's time to train our model. There is some point that we need to aware of before start train our model such as a number of epochs, and make sure we set our model to training mode by model.train(). For the number of epochs, there are many questions have been asked about selecting the best number of epochs. But for now, we need to turn manually. Then we should save our model, so we can load it for use later. After train completed, we can check our model accuracy with our featuresTest, labelsTest. Let's plot the result of our prediction. As you can see in above pics, our model predicted well after we train it with 100 epochs. Now, let put our model to the test. We are going to load train.csv from kaggle competition and use our model to predict it. Then we submit our prediction to kaggle to check the score of our model. In out test dataset, we have 28000 rows and 784 columns since it doesn't include label. Let extract our test features and convert it to torch tensor. Since we save our model in train section, in pytorch we can load it back with ease. Next, let's use our model to prediect the result. You need to make sure turn our model to eval mode model.eval(). We can start our prediction and obtain the result in out predefine numpy array. Where we save it into csv file later. # # write result into file "submission.csv"
Finally, we can submit our result to kaggle via comman and make sure you in right folder. kaggle competitions submit -c digit-recognizer -f submission.csv -m "Second submittion"
Yaa! Let's check our result. Ya, we got 0.96814 and rank 2102. Not bad for beginer. Maybe you can help improve the model. We just finish building an ANN model using Pytorch to recognize hand written digit with 0.96814 scores on kaggle. However, there are many network architecture that you can use for this task such as Convolutional neural network(CNN). So it's your turn to try to solve this task with different network and share your result in the comment below. I cannot wait to see what score will you obtain.